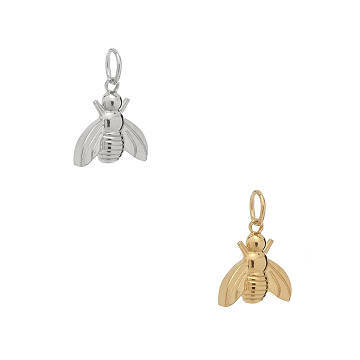 Casey Benjamin’s inspirational bee charm celebrates industriousness. Two-time cancer survivor Casey Benjamin believes that the jewelry you wear every day can bring "good juju" into your world. Like this busy bumble bee symbolizing industriousness. Through intense cancer treatment, Casey surrounded herself with items that filled her with hope and reminded her to stay optimistic. Now, she's creating inspirational pieces to help others get through their own rough times. Whether it's worn alone or paired with other meaningful charms, it's a lovely way to spread a little good juju. Designed and hand-assembled in Brooklyn, New York. Casey Benjamin believes there’s power in the jewelry you wear every day. “Good juju,” she calls it, and its healing energy is personal to her. The mom of two, who lives and designs in New York City, discovered its magic when cancer struck—again. Dormant for eight years, the disease came back with a vengeance, forcing Casey to fight for her life. Throughout intense treatment, she found that the items she surrounded herself with really made a difference in her mood and outlook. They reminded her of positivity, hope, healing, and a life beyond medicine. In the wake of cancer, Casey reconnected with her lifelong friend Jonathan Singer. They shared their most beloved lucky charms with one another—trinkets, crystals, talismans—and realized that positivity-packed jewelry could help others as well. Today, Casey is healthy and the pair run their jewelry business together. Casey designs the pieces, Jonathan (who Casey calls her “co-pilot" in life) manages the business, and the charms do the work of spreading good juju. Charm: .5" L x 3/4" W Chain: 18"
Wipe gently with soft anti tarnish cloth.